Speaking in front of the Santa Barbara City Council last week, Sanchez said that the early release of state prisoners through realignment has contributed to higher crime rates in the city, particularly with property crimes. He also claimed that the alleged increase had prompted him to move officers out of community oriented units and into the property crimes unit. However, in November, only one burglary arrest was made and the suspect was not released early because of realignment. In October, there were six arrests made and one of the suspects had been involved in realignment. Police department spokesman Riley Harwood confirmed the misstatements by the chief that Harwood said came from an unrelated statistic. When police do compliance checks on realignment subjects’ homes, the searches result in arrests 50 percent of the time, Harwood told Noozhawk. I find it intresting that the SB Police Chief qouted his statistics incorrectly. This the same police chief that had illegally Wayne Scole asrrested at a family function. It disheartening to see all these police chiefs, Solomon, Mulhall, Annibali, Macagni, along the Central Coast abusing power. Sounnds like some house cleaning needs to take place. What’s the story on Wayne Scole? I haven’t ever heard of this incident. Cindy heres the story on Cam Snachez and Wayne Scoles. 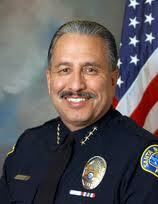 You can google the SB police chief and get several stories of his ongoing misconduct as a chief. I have a hard time believing any statistics these days, especially government. The questions and results are usually slanted to fit an agenda and used to gain public support. Welcome to the police state–the land of true lies.